The MCUA members support all kinds of cannabis awareness raising events. Here is where you will be able to stay tuned to the event calendar so as not to miss an event near you. This link is updated regularly with nation wide happenings .. if you are organising an event please contact this page owners at this link The MCUA itself organises events from time to time and these will be updated here. The next event for the MCUA calendar will be our first Annual General Meeting to elect our first management committee. This will be an online event set down for 10th September 2016. All registered members are invited to take part either online or in person at the physical meeting which will be held on the Gold Coast. Nominations have been trickling in and we thank those who have taken the time to consider a position and put their hand up for more formal engagement in the activities of the MCUA of Australia Inc. The medican workshops are designed by a local (Guru) who has taught most of the leading medicinal cannabis tincture and C.O. producers in this country. Each workshop has the similar format with a new list of respected guest speakers. We are all about sharing knowledge. The first two workshops proved very informative for members of the public who are now hearing more about the medical benefits of cannabis. The workshops also provided much information about the best methods of producing cannabis preparations and great Q & A sessions. For genuine people to learn the best methods of production. To make safe, effective, reliable tinctures and C.O. Get the best advice, tips and knowledge. Q & A session. Meet & greet the speakers! Meet others that want to produce a product that actually heals and cures. Entry by donation. Learning and sharing is one of our most valuable assets... FREE KNOWLEDGE. Bring the patient's (if they aren't yourself) so they can see how things work in person. There will be cameras and many mics, so please turn you mobile phones off, silent is no good because rf signal (that noise you sometimes hear from your car stereo when you are about to receive a call.) can be picked up by some mics. IF it's essential for you to have it on, please ask at the door for a "safe from interference seat." If you must take pics. PLEASE use a camera. NOT a mobile phone. 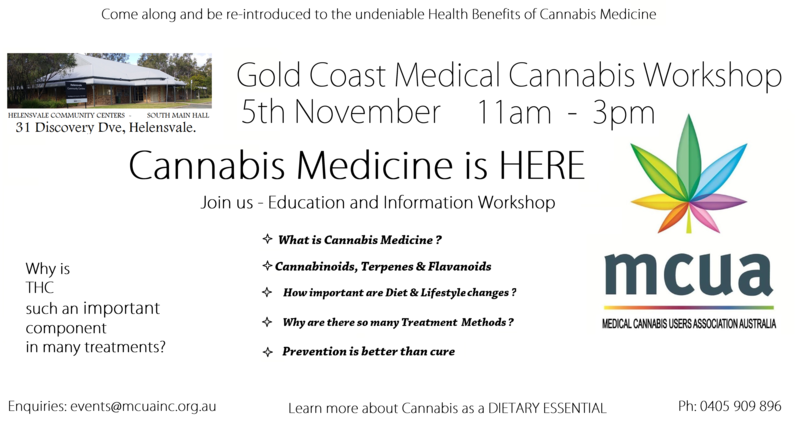 Nimbin is hosting another Medican Workshop in the Nimbin Town Hall. As usual, there will be great food at the kitchen, informed speakers and many opportunities to connect with people who are good with questions. Come and learn, bring a friend. We look forward to seeing you there. Come and join us on 02/10/2016 for our third Wollongong medicann symposium.